It has been almost 5 years and a half since the Great East Japan Earthquake and Tsunami occurred in March 2011. 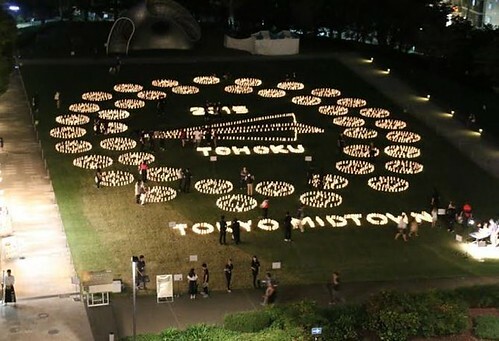 To convey the messages from the people of the disaster area, “Washi Candle Garden -TOHOKU 2016-” organized by students from Tama University in collaboration with Tokyo Midtown, will be held at Tokyo Midtown in Roppongi from Septemeber 9 to 11. During the event period, 4,700 washi (Japanese paper) lanterns will be lit in the garden and courtyard of Tokyo Midtown. Among those lanterns, around 2,400 are with hand-written messages by Tohoku residents and 1,200 are with hand prints of the children in Tohoku. It is going to be the 7th time the students organize such event. This year, they visited 40 cities and towns in three prefectures in the Tohoku region to communicate with around 3,600 people and to collect their messages on the washi papers.